ทีม Ad Optimizer ของ Heroleads ได้เข้ารับการอบรมและทดสอบเพื่อประเมินศักยภาพในการการทำการตลาดออนไลน์และการบริหารโฆษณาเป็นระยะเวลากว่า 6 เดือน ในที่สุด Heroleads ก็สามารถคว้ารางวัลมาไว้ในครอบครองได้ถึง “3 รางวัล” ได้แก่ รางวัล “Account Excellence” รางวัล “Industry Rising Star” และรางวัล “Performance Excellence Honors Agency” ซึ่งถือเป็นรางวัลสูงสุดจากงาน “Google Performance Honor 2017” ในครั้งนี้ได้สำเร็จ ตอกย้ำความเป็น ‘กูรูด้านการตลาดออนไลน์ตัวจริง’! 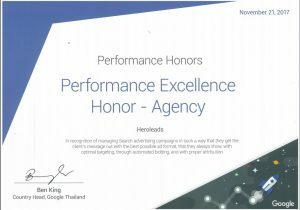 Heroleads joined the first-ever “Google Performance Honors 2017” with other top 20 digital agencies or 200 participating individuals in Thailand to advance their skills in performance advertising through the program. 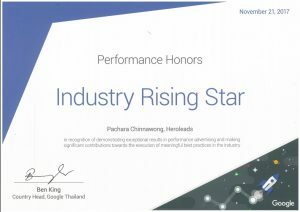 This ‘Industry Rising Star (Individual)’ award was presented to an individual of digital agency who demonstrated exceptional measurable results in performance advertising via paid channels. 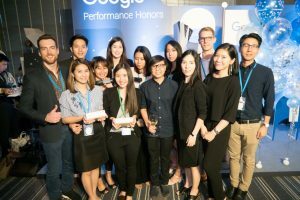 The winner had to demonstrate results and/or make significant contributions towards the execution of meaningful best practices in the performance advertising industry. The ‘Account Excellence’ award was given to the digital agency that exceptionally managed Search advertising campaigns using 5 Aces of Performance Excellence to deliver clients’ messages with the best possible ad format and ensure that they always show with optimal targeting, through automated bidding, and with proper attribution. For those who may want to learn more about these two Google’s programs, the Performance Guru program was especially held for selected agency members to accelerate their performance advertising expertise. It was split into three segments: Green, Blue, and Black Belt and participants needed to complete every workshop and pass the examination. 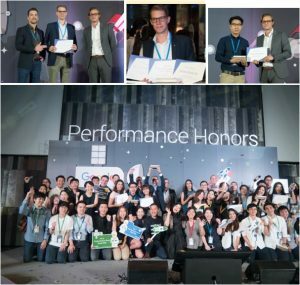 Besides the workshop, Google also held Performance Honors, the awards program that recognized stellar agencies and individuals who have shown innovation and excellence in performance advertising. This great accomplishment is definitely a significant milestone for Heroleads. 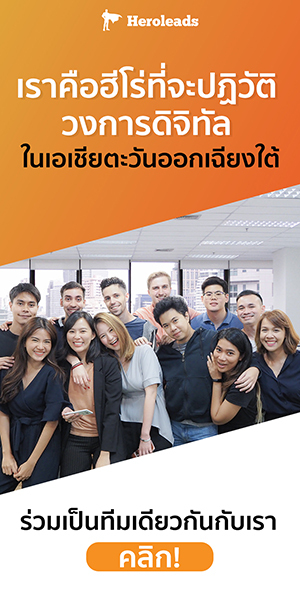 However, it will not stop us to keep on striving to become Thailand’s No.1 digital performance agency to help make your business successful online. Put your hero cape on.And get ready to soar with us! Heroleads is a digital performance technology for sales & marketing. We employs data-driven methodology helping clients to build and sustain profitable customer relationships. We are Premier Google Partner. We have a strong team of ad optimization masters. We have effective and trackable Call Tracking system. We have a professional team who strives every day to help make your businesses grow online.